In a hotel an engineer, a physicist and a mathematician are sleeping when a fire breaks out. 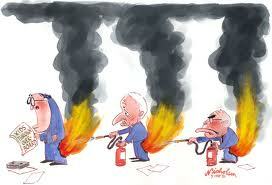 The engineer wakes up, notices the fire, grabs the next fire extinguisher and starts spraying. After what seems hours of heroic fighting the fire is gone and he goes to sleep again. But the fire breaks out again. The physicist wakes up, notices the fire, grabs the fire extinguisher. Stares at the fire for some minutes, does some calculations in his head - air flow, humidity, thermodynamic whatever - and then - with one blow from the extinguisher at the right point the fire is out and he goes to sleep again. But the fire breaks out again. The mathematician wakes up, notices the fire, sees the extinguisher - "aaaah, the problem is solvable"
and goes to sleep again.